Yes, I really had my hands dirty yesterday while dressing our little beastly turkey. 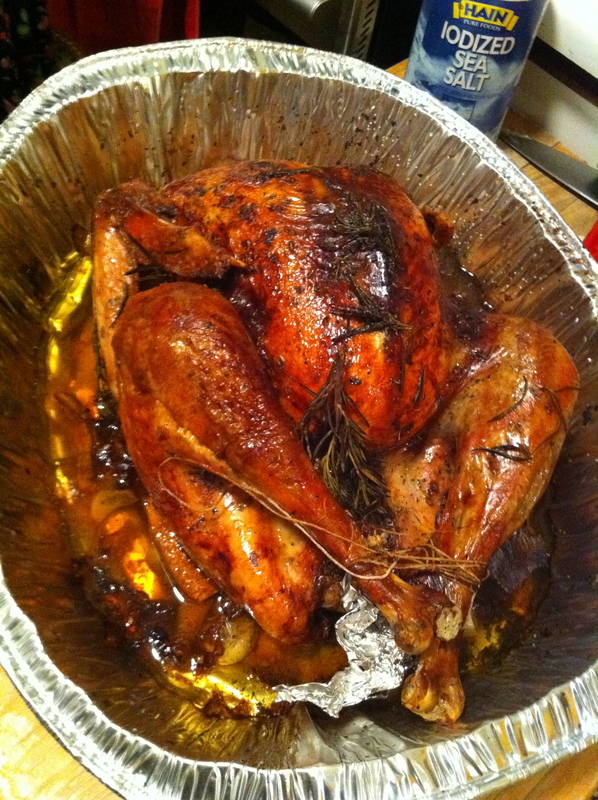 The story is, this is my second turkey ever. My daughters convinced me we needed to have a nice Thanksgiving dinner, so we went out and at the last minute we bought a 14-lb bird and the other ingredients, including a nice Australian Syrah from 2006 and a wonderful sweet Marsala as both a dessert wine an to prepare the stuffing. First we dressed the turkey with a vinaigrette made out of EV olive oil, balsamic vinegar, dried basil, parsley and thyme, salt and fresh rosemary. I mean, hand-dressed: that’s the most wonderful thing a chef must do in his kitchen! Then, I sauteed olive oil, the bird’s liver, carrot, celery, basil, parsley and onion, together with dried cranberries, bread crumbles, minced meat, all with some generous amount of Marsala wine. Some 15 minutes later, I added the ready stuffing to the bird’s interior, closed it up (with cotton thread!) and in the oven she went. The turkey was really good in the end, so I felt doubly blessed. The girls loved every little bit of the whole enterprise. interesantes, por cierto una receta realmente deliciosa para disfrutar en familia, Gracias. Man, that turkey looks so good! I am jealous, we had some mean pork chops, but now that I see this 14 lbs beast I feel like I missed out. Happy Thanksgiving to you too Antonio!